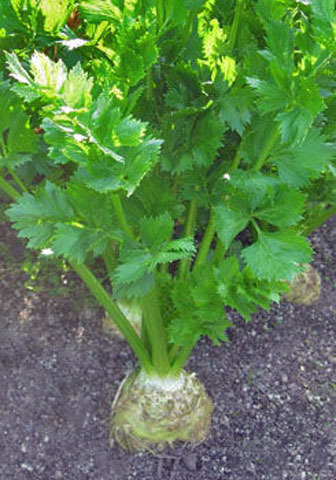 This vegetable is related to 'Celery' and has a similar smell and flavour. The main difference is; it is grown for its turnip like bulbs rather than its stem, and is much hardier and more disease resistant than Celery. It is actually a biennial but usually treated as an annual in the UK. The recognised harvesting period is from October to March the following year. If left in the ground it is advisable to cover them with a thick mulch of straw to keep the soil from feezing. It is a useful vegetable for eating during the winter months, as it can be left in the ground until required. The leaves when chopped up can be added to soups and stews to add flavour. Sow the seeds on the surface of the compost as they need light to germinate. They only require gentle heat to germinate, 12°-16°C (55°-60°F) will do. Once established thin the seedlings to 15-20cm (6"-8") apart. Once the plants are large enough to handle prick them out into 70mm(3") pots and grow them on 10°-12°C (50°-55°F) for a couple of weeks, then place them in a frost free coldframe until planting out time. Plant out 20-30cm (8"-12") apart. in moisture retentive humus rich soil, preferably in full sun. Keep the soil moist at all times, applying an organic mulch can help to create the ideal conditions. This will also help to keep the bed weed free. As the bulbs begin to swell remove any leaves that are lying prostrate on the soil and this will help the bulbs to ripen / mature. Similarly remove any side shoots as they appear. Pick as required, or pick them and remove the leaves, then bury them in boxes of spent compost and store them until required. These are partial to young seedlings so preventive action should be taken to avoid any damage. Visible signs of this is brown blisters caused by the larvae tunneling through the leaves, growing under horticultural fleece will help to keep this pest at bay. There are no insecticides available so vigilance is key. If signs are visible remove the affected leaves and destroy. This generally affects older leaves and is seen as brown spots on the leaves, if left unattended the problem will extend to the younger leaves. Spraying with a copper based fungicide can help. Using treated seed can also help.